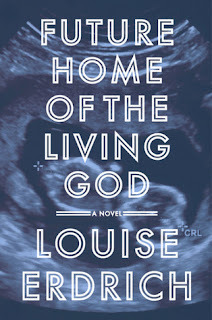 Future Home of the Living God by Louise Erdrich is a very highly recommended novel of speculative fiction. Cedar Hawk Songmaker is twenty-six, pregnant, and writing this book for her unborn child. Cedar is the adopted daughter of Sera and Glen Songmaker, open-minded Minneapolis liberals who have raised her to embrace her Ojibwe roots. She is also in contact for the first time with her birth mother, Mary Potts, who lives up north, on the Ojibwe reservation. She contacted Mary Potts because she wanted to understand her origins for herself and her baby. While she hasn't been paying a lot of attention to the news, apparently evolution is moving backwards. While it is moving backwards quickly for many creatures and plants, what is alarming is that women are now giving birth to infants who are from a more primitive species. A new government is in control. Now it seems that pregnant women are being rounded up and sent to special hospitals, or prisons, so they can be watch and monitored during their pregnancy. Apparently Cedar may be one of the few women who is giving birth to what seems to be a normal baby. Cedar manages to hide for a while, but with eyes everywhere watching, it is questionable how long she can stay hidden. Cedar writes down everything that is happening to her and around her. She records her unborn child developmental milestones, and notes about how life used to be for her baby. This is how to set a pregnant woman in a bleak dystopian world and have her talk to her unborn child. Erdrich captures what was missing in a previously reviewed novel (The End We Start From). In that novel the protagonist also basically ignored the news and didn't have a whole lot of information about the disaster, but here Cedar shares what she knows, which helps the reader enormously. Cedar's parents tried to get her to see the news - she was just preoccupied with her own news. I know it might seem shocking for some people, but there are many who don't watch or read the news with any regularity. I get that. I believe that if the world was ending in some way that information, real information would be lacking and not freely forthcoming from officials. But I also believe that people would get a hold of the dribs and drabs of what was happening and react accordingly. Cedar is a well-developed character and definitely comes across as a realistic individual with her own thoughts and feelings. She is an intelligent woman, who, once she understands what is happening, she decides on a plan of action. She is portrayed as human and thus is conflicted enough to have issues with the baby's father and her adoptive mom. She struggles while trying to bond with her birth family. I appreciated that Erdrich had Cedar embrace a religion, Catholicism. She's not perfect, but she manages to adapt to every impossible situation she is faced with. I found Future Home of the Living God to be an excellent novel. The writing is extraordinary - intelligent and captivating. The narrative is compelling, with a plot that is chilling and believable. Erdrich has several current political points that translate well into this plot, such as the misuse/abuse of political power, governmental spying, reproductive freedom, self-determination, environmental changes, and questioning the wisdom of altering biology. I raced through this novel and stayed up too late finishing it because I simple couldn't set it down. While Future Home of the Living God is reminiscent of and shares some basic elements with The Children of Men and The Handmaid's Tale, it is definitely its own story.